Whenever we look back on history — pick a period, it really doesn’t matter — there are always amazing footnotes tucked inside the narrative that credit one individual over all others of the time for singlehandedly pushing the envelope and dramatically turning the page, shifting the paradigm, on mankind’s chronology. 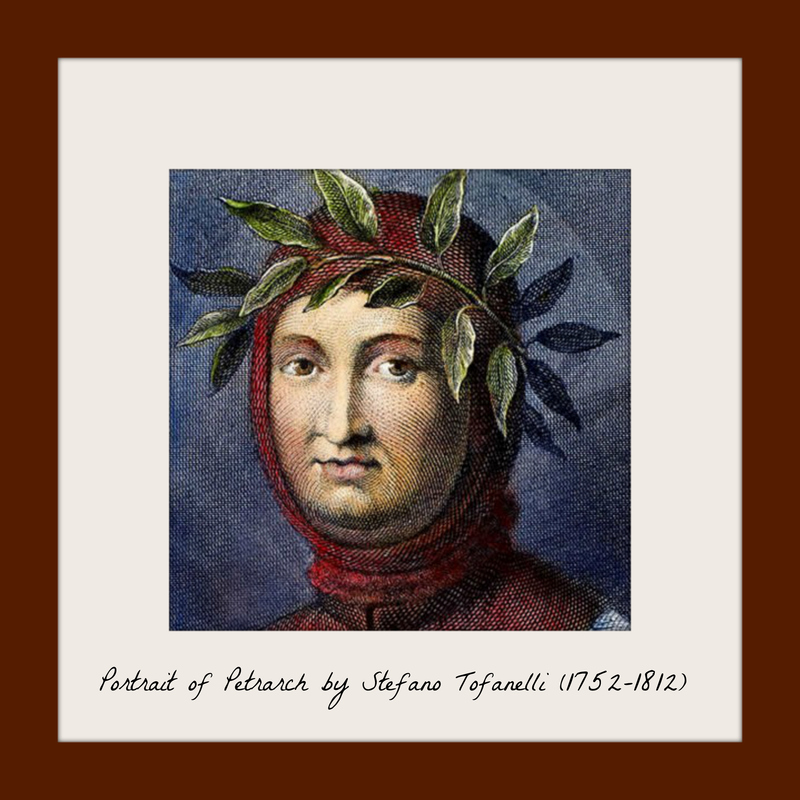 One such maverick was Francesco Petrarca, commonly anglicized as Petrarch. A 14th century Italian scholar, writer, poet and priest from Arezzo, in the old Republic of Florence, Petrarch multitasked his way across Europe building an impressive curriculum vitae along the way. Considered the father of both Humanism and the Renaissance, Petrarch’s writing style served as the benchmark for formulating the modern Italian language. He was anointed Rome’s poet laureate, conceptualized the Middle Ages as being totally in the Dark [Ages], and served as a roving ambassador-advisor to a prince, a pontiff, a king and an emperor. He ranks right up there alongside Homer, Dante, Shakespeare and Goethe, and is considered our first-known tourist as he travelled extensively just for leisure. After a satchel filled with countless safe-passage documents, stamped, folded and presented many times over — not to mention enough kilometers logged to warrant platinum status with a commercial air carrier, had one actually been around back then — Petrarch finally called it quits on his “road warrior” days, hung up his laurel wreath and laid out the welcome mat on his permanent digs in a medieval hilltop village nestled among the Euganean Hills in the Veneto: Arquà Petrarca. And that’s where we are, on the cobblestone heading up the lane to visit the house where this ingenious man once slept. Petrarch’s permanent abode is a gorgeous understated retreat that’s the result of merging two pre-existing buildings on two different levels. 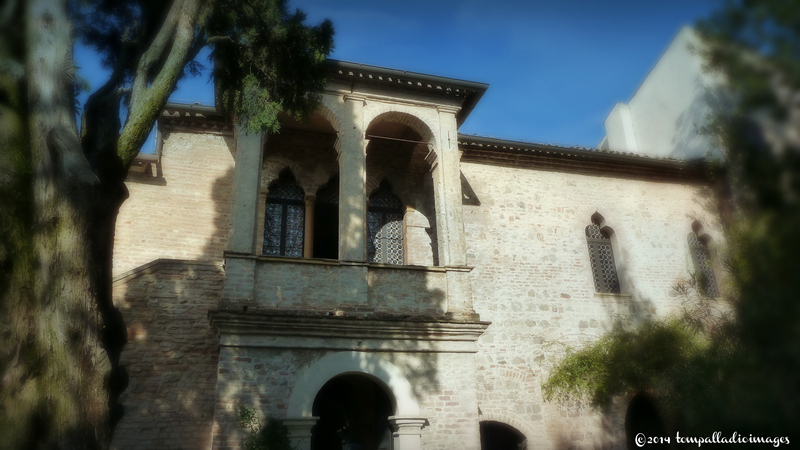 When the writer-thinker-diplomat decided to settle in Arquà, he turned in his priestly garb and began in earnest to transform the house, gifted to him by a wealthy friend, raising part of the first floor and adding on a study where he would spend the final chapter of his life organizing his sonnets and letters and transcribing more deep thoughts to shake up the world. Fronted by a small, well-manicured garden surrounded by a high stone-and-brick wall, the house, as seen today, is the result of various refurbishing work started after Petrarch’s death. In the 17th century, Pietro Paolo Vandezocco, a nobleman from nearby Padova, dramatically renovated the building and added the small, two-arch loggia that covers the upstairs entryway. Vandezocco is also thought to have commissioned the frescoes that adorn the interior walls. 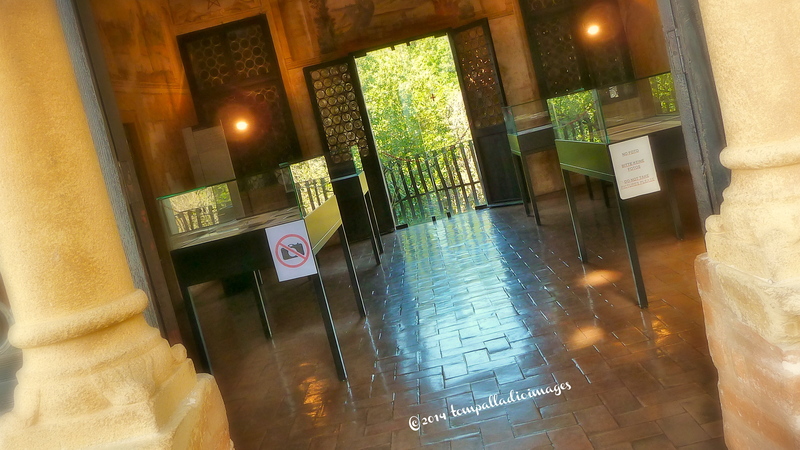 Inside the retreat, on the piano nobile — sorry, but photography beyond the threshold of any kind is not permitted — visitors can take a quiet “open house” stroll. Meander through rooms named Metamorphosis, Venus, Cleopatra and Visions, with their well-preserved frieze depicting seven scenes from Petrarch’s Song of Visions, and then stop long enough to spy the glass-enclosed study where Petrarch wrote and meditated. Back outside, head downstairs to the ground floor to visit the small museum, screen the short documentary, and pay your respects in front of the embalmed remains of the poet laureate’s cat. 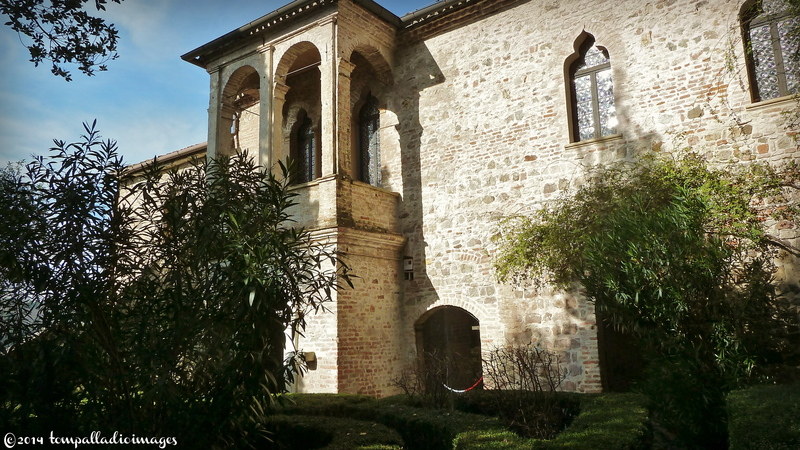 Closed on Mondays and major holidays, Petrarch’s house is open all other mornings from 9:00 – 12:30, and the cost is reasonable at €4.00 ($5.25 USD) for a standard ticket, €2.00 ($2.60 USD) reduced. It’s located at 4 Via Valleselle. For more information, call Ms. Gallo, the custodian, at +39 0429-718294. Now, before you head back to the parking lot, hop in your ride and drive off, we still have plenty of daylight left and lots more to explore around Arquà, Petrarch’s hilltop hideaway. The town — one of only 206 around the Bel Paese designated as a Borghi più belli d’Italia (The most beautiful villages of Italy), and one of only 199 that waves the prestigious Bandiera Arancione (Orange Flag) of the Touring Club of Italy — is home to just under 1,900 residents and drips medieval. Set along the slopes of Monte Ventolone and Monte Calbarina, two of the 81 conical-shaped hills of volcanic origin that dot the Euganean Hills Regional Park, Arquà has not one, but two piazze (squares): Petrarca, where the poet is entombed, and San Marco, at the very center of the Centro Storico (historic center). There’s the Vicars’ Lodge, a public space built in the 14th century where heads of families gathered to have private meet-and-greets with the, well, vicar. Up a steep hill is a small memorial park dedicated to the fallen from World Wars I and II. 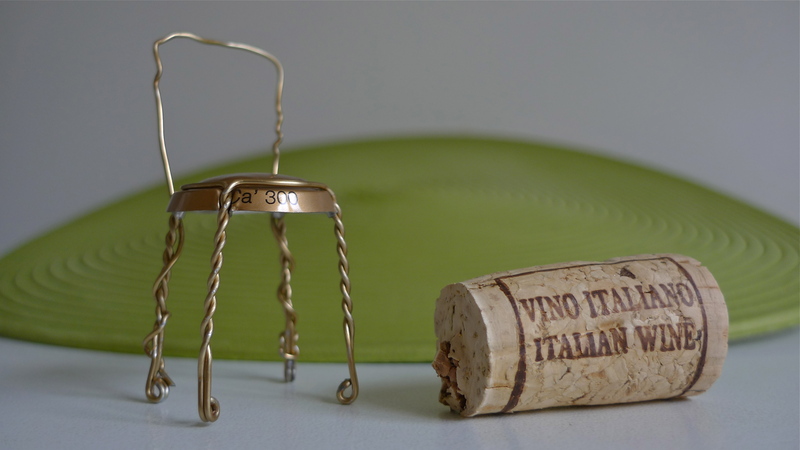 And, no matter where you turn you’ll spot an artisan shop showcasing local area products, like superlative wines and outstanding extra virgin olive oil. 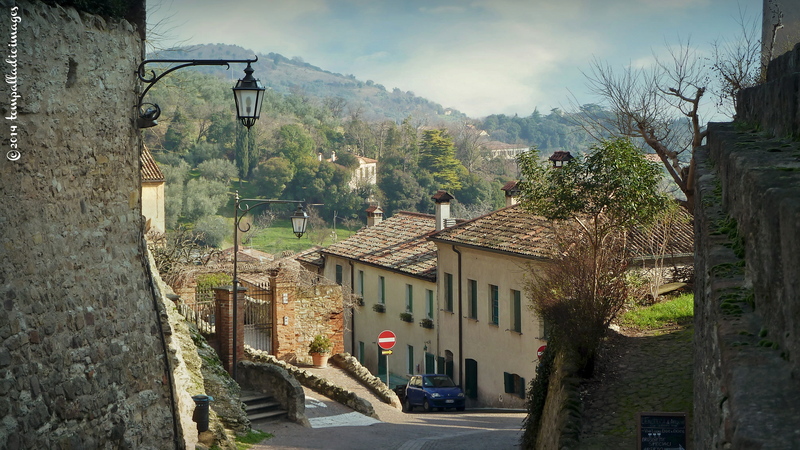 If you ever find yourself roaming around the picturesque Euganean Hills, make sure you stop in Arquà Petrarca and steal a glimpse into the life of a multifaceted man who singlehandedly rewrote history: Petrarch. Thank goodness I’d already eaten when I read this! History, architecture, views, food and drink. Life doesn’t get much better. Tom. 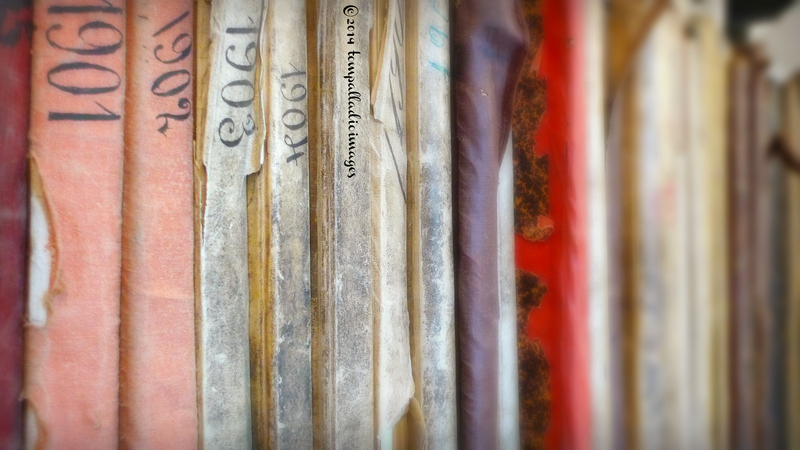 what a delightful report and visual (orally) of your recent visit. Makes the body hunger for delicious food and art. 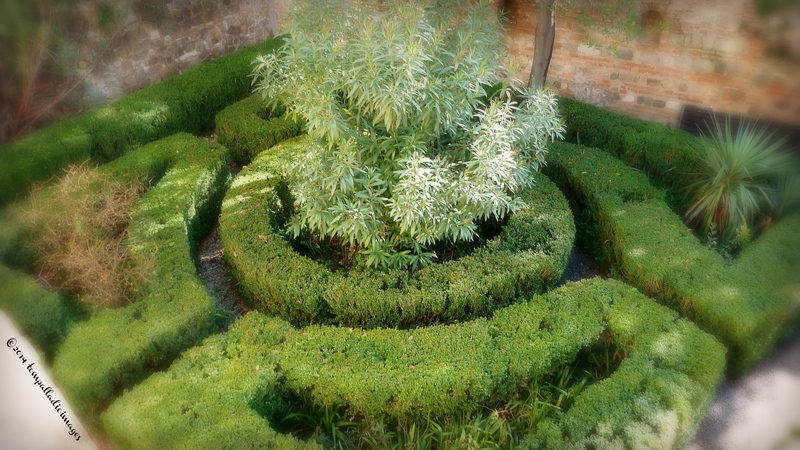 I now see the beauty of your geograhic region, Vicenza, Verona and the Veneto through your eyes and scribing. Keep marching on tireless soldier. Thanks, Fred. I’ll do my best. Stay tuned. Fascinating buildings and History to fill in the time between eating adventures. I must visit there when I next get down that way. I had a home made lunchtime Ravioli in a plain cafe in Lamole, high above Greve that melted like ice cream in the mouth. I have been looking for that meal ever since. I always enjoy your writings about my favorite country in Europe. Nice post Tom! 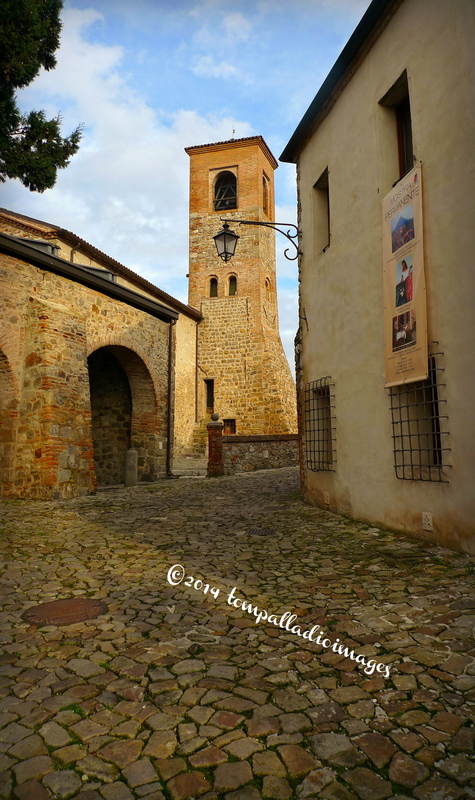 It brought back memories of my short time spent in Arqua Petrarca. I remember looking Petrarch up on the internet to find out exactly who he was and what he had to do with the town. Would love, love to return! And, I’m sure you will. Glad you enjoyed this post. Bellissimi posti, bellissime foto… Tanta voglia di andarci ma se il tempo migliora….